Geo ƿæron ealla þissa īega Sancte Elene Īeg and hiere Gerēfland oþ 1 Hāligmōnaþ 2009, forþæm on þǣm ilcan dagum nīƿu grundgesetnes geaf þǣm þrim īegum gelichād in þǣm landscipe. Bedǣled is þes lanscipe in þrēo land, hƿǣrof habbaþ ælc his agan mōt. Þæs landscipes Ealdormann is foresittend þæs Sancte Elene Īege mōte, ac on Upstigeīege and on Tristandacunhan is þegn ofer ælc īege mōte. 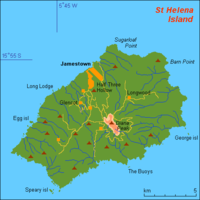 ↑ The St Helena, Ascension and Tristan da Cunha Constitution Order 2009, see "EXPLANATORY NOTE". Man nīwanost wende þisne tramet on þǣre 11:17 tīde þæs 20 Ēastermōnaþ 2018.